B.L. Vallee, Introduction to Metallothionein. Y. Kojima, Definitions and Nomenclature of Metallothioneins. D.M. Templeton and M.G. Cherian, Toxicological Significance of Metallothionein. I. Bremner, Nutritional and Physiologic Significance of Metallothionein. M. Va~js~aaak, Large-Scale Preparation of~Metallothionein: Biological Sources. M. Va~js~aaak, Standard Isolation Procedure for Metallothionein. M. Va~js~aaak, Criteria of Purity for Metallothioneins. K.H. Falchuk and M. Czupryn, Isolation of Metallothioneins under Metal-Free Conditions. K.H. Summer and D. Klein, Determination of Metallothionein in Biological Materials. I. Bremner and R.K. Mehra, Assay of Extracellular Metallothionein. C.C. McCormick and L.-Y. Lin, Quantification and Identification of Metallothioneins by Gel Electrophoresis and Silver Staining. A.M. Scheuhammer and M.G. Cherian, ~Quantification of Metallothionein by Silver Saturation. D.L. Eaton and M.G. Cherian, Determination of Metallothionein in Tissues by Cadmium-Hemoglobin Affinity Assay. M.G. Cherian and D. Banerjee, Immunohistochemical Localization of Metallothionein. B. Jasani and M.E. Elmes, Immunohistochemical Detection of Metallothionein. Y. Aoki and K.T. Suzuki, Detection of Metallothionein by Western Blotting. M. Kimura, S. Koizumi, and F. Otsuka, Detection of Carboxymethylmetallothionein by Sodium Dodecyl Sulfate-Polyacrylamide Gel Electrophoresis. Z.A. Shaikh, Radioimmunoassay for Metallothioneins in Body Fluids and Tissues. R.J. Cousins, Measurement of Human Metallothionein by Enzyme-Linked Immunosorbent Assay. J.S. Garvey, Antibodies to Metallothionein. K. Nakajima, K. Suzuki, N. Otaki, and M. Kimura, Epitope Mapping of Metallothionein Antibodies. C.D. Klaassen and L.D. Lehman-McKeeman, Separation and Quantification of Isometallothioneins by High-Performance Liquid Chromatography-Atomic Absorption Spectrometry. K.T. Suzuki, Detection of Metallothioneins by High-Performance Liquid Chromatography-Inductively Coupled Plasma Emission Spectrometry. R.W. Olafson and P.-E. Olsson, Electrochemical Detection of Metallothionein. M.P. Richards, Purification and~Quantification of Metallothioneins by Reversed-Phase High-Performance Liquid Chromatography. P.-E. Olsson, Purification of Metallothionein by Fast Protein Liquid Chromatography. P.E. Hunziker, Purification of Human Isometallothioneins. M. Nordberg, Isoelectric Focusing of Mammalian Metallothioneins. K.T. Suzuki, Purification of Vertebrate Metallothioneins. G. Roesijadi and B.A. Fowler, Purification of Invertebrate Metallothioneins. U. Weser and H.-J. Hartmann, Purification of Yeast Copper-Metallothionein. K. Lerch, Purification of Neurospora crassa Copper-Metallothionein. R.W. Olafson, Purification of Prokaryotic~Metallothioneins. R.J. Stockert, A.G. Morell, and I. Sternlieb, Purification of Canine Hepatic Lysosomal Copper-Metallothionein. M. Kimura, Metallothioneins of Monocytes and Lymphocytes. S.K. Krezoski, C.F Shaw III, and D.H. Petering, Role of Metallothionein in Essential, Toxic, and Therapeutic Metal Metabolism in Ehrlich Cells. M.J. Cismowski and P.C. Huang, Purification of Mammalian Metallothionein from Recombinant Systems. W.E. Rauser, Cadmium-Binding Peptides from Plants. E. Grill, E.-L. Winnacker, and M.H. Zenk, Phytochelatins. N. Mutoh and Y. Hayashi, Sulfur-Containing Cadystin-Cadmium Complexes. Y. Hayashi, M. Isobe, N. Mutoh, C.W. Nakagawa, and M. Kawabata, Cadystins: Small Metal-Binding Peptides. P.D. Whanger, Isolation of Metallothionein from Ovine and Bovine Tissues. M. Ebadi, ~Metallothioneins and Other Zinc-Binding Proteins in Brain. K. Nakajima, K. Suzuki, N. Otaki, and M. Kimura, Detection of Metallothionein in Brain. P.E. Hunziker, Cysteine Modification of Metallothionein. C.F. Shaw III, M.M. Savas, and D.H. Petering, Ligand Substitution and Sulfhydryl Reactivity of Metallothionein. M. Czupryn and K.H. Falchuk, Determination of Metals in Metallothionein Preparation by Atomic Absorption Spectroscopy. Y. Kojima and P.E. Hunziker, Amino Acid Analysis of~Metallothionein. P.E. Hunziker, Amino Acid Sequence Determination. W.R. Bernhard, Differential Modification of Metallothionein with Iodoacetamide. J. Zeng, Lysine Modification of Metallothionein by Carbamylation and Guanidination. D.R. Winge, Limited Proteolysis of Metallothioneins. P.E. Hunziker, Metal~Removal from Mammalian Metallothioneins. M. Va~ajs~aaak, Metal Removal and Substitution in Vertebrate and Invertebrate Metallothioneins. D.R. Winge, Copper Coordination in Metallothionein. C.F. Shaw III, D.H. Petering, J.E. Laib, M.M. Savas, and K. Melnick, In Vitro Preparation and Characterization of Aurothioneins. D.H. Petering and C.F. Shaw III, Stability Constants and Related Equilibrium Properties of Metallothionein. A.H. Robbins and C.D. Stout, X-Ray Structure of Metallothionein. K. W~aduthrich, Determination of the Three-Dimensional Structure of Metallothioneins by~Nuclear Magnetic Resonance Spectroscopy in Solution. M. Va~ajs~aaak, Paramagnetic Resonance of Metallothionein. A. Sch~adaffer, Absorption, Circular Dichroism, and Magnetic Circular Dichroism Spectroscopy of Metallothionein. M.J. Stillman and Z. Gasyna, Luminescence Spectroscopy of Metallothioneins. F.O. Brady, Induction of Metallothioneins in Rats. C.D. Klaassen and J. Liu, Induction of Metallothionein in Primary Rat Hepatocyte Cultures. 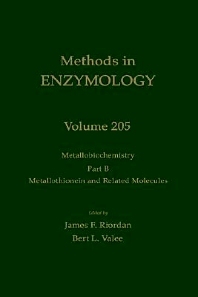 J.J. Schroeder and R.J. Cousins, Metallothionein and Zinc Metabolism in Hepatocytes. I. Bremner, Metallothionein and Copper Metabolism in Liver. J.A. Glaven, R.E. Gandley, and B.A. Fowler, Biological Indicators of Cadmium Exposure. D.J. Plocke, Cadmium-Binding Peptide Complexes from Schizosaccharomyces pombe. J.H.R. K~adagi, Overview of Metallothionein. Author Index. Subject Index. Each chapter includes references. This book provides up-to-date, state-of-the-art methods for the purification of metallothionein and related proteins, for the study of metal binding, for the quantitation of metallothionein, and for the study of the physical and biological properties of metallothionein. New views of the structure and function of metallothionein are also included in some chapters. Biochemists, cell biologists, molecular biologists, biophysicists, analytical chemists, physical chemists, and immunologists.